The heart of LAAC’s social scene where old Hollywood glamour meets a downtown cosmopolitan edge. Offering everything from vintage books to crystal chandeliers, two story ceilings with old world mahogany, and an Olympic Torch from the 1984 Olympics. A place to come and exchange ideas and create lifelong relationships. 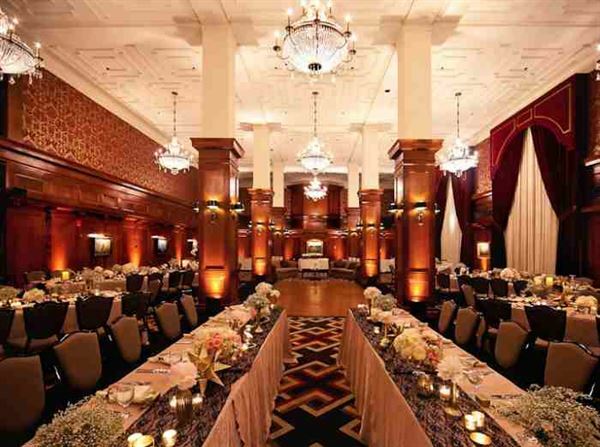 The Los Angeles Athletic Club is one of the most stylish wedding locations in all of Los Angeles. My husband and I had never even heard of the place until a good friend of mine suggested it during our early wedding planning stage. Her parents were members, and they were able to schedule a tour for us before we decided on it. The LAAC simply took our breath away! The lobby of the hotel itself was absolutely glorious. Besides the beautiful hotel and vast gardens, it also offered a wonderful rooftop reception venue for after the wedding. The catering was delicious and left nothing to be desired. It really did cover all the bases in one easy, magnificent location. My friends and family could not stop raving about how lovely the wedding AND reception was!